Clean and delicious, we love this daiquiri because it’s super easy to make but tastes like you slaved behind the bar. Punch up the look by using fresh lavender as the garnish. Pair with your favorite takeout. Combine all the ingredients and shake with ice until your shaker tin goes frosty. Strain into a coupe and serve with fresh lavender or a lime wheel. Taste the holidays at any time of year. This warm, rich cocktail is as perfect for Thanksgiving as it is for a Memorial Day banquet. Plus, it's a cinch to make but your friends will never guess it only has four ingredients.Serve with your favorite feast! Adored by many, this is a super simple recipe that tastes like you spent heaps of time behind the bar. We've listed the instructions for a single serving below but it's easy to batch all our cocktails. Use double the rum to simple syrup and fresh juice.Serve with Caribbean-inspired foods if you want to create a theme. Our Spiced Daiquiri is also a hit with burgers, wings and tacos. Clean and delicious, we love this daiquiri because it's super easy to make but tastes like you slaved behind the bar. Punch up the look by using fresh lavender as the garnish.Pair with your favorite takeout. Greenbar Distillery, 2459 E 8th St, Los Angeles, California, 90021, USA. 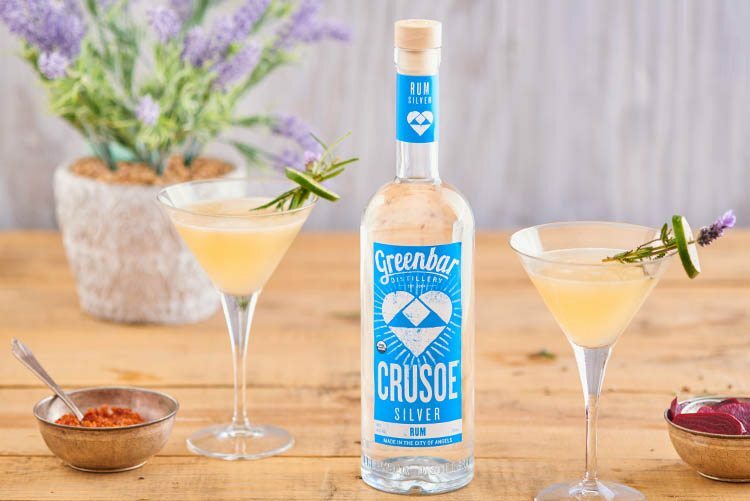 Greenbar Distillery makes the world’s largest portfolio of delicious, organic spirits. Get Greenbar Distillery logos, images, datasheets and distillery information. Have a good time but stay in control. For advice visit Responsibility.Org. GREENBAR, BAR KEEP, CITY BRIGHT, CITY AMBER, CRUSOE, FRUITLAB, GRAND HOPS, GRAND POPPY, IXÁ, SLOW HAND & TRU are trademarks of Greenbar Distillery. © Copyright 2004 - 2018. All rights reserved.